We often don’t find city passes or discount passes to be great deals for us because we’re slow travellers. We like to have a good look around, spend some downtime in a local cafe or tea shop, take time out to eat and wander off on a few tangents along the way. That said we did pick up the Osaka Amazing Pass on our first visit to the city and while it might not have been “amazing” value it turned out to be pretty darn good. We’ll definitely pick up another one next time we’re in town as there are still plenty of Osaka attractions we want to see. Did we get good value? There are two versions of the pass, the one or two-day option. A day counts as a calendar day, not a 24 hour period so you want to pick it up as early as possible or perhaps ahead of time if you can. It doesn’t activate until you first use it so you can purchase it in advance. The card can be used on a variety of the local transport but it’s likely to be the subway you use most within the city. As a foreigner I find the subway the easiest to navigate, it’s fast and there are so many stops you can always get one that’s close to where you need to go. There are around 28 attractions that are fully covered by the pass, some are seasonal and other special additions are included for a limited time. 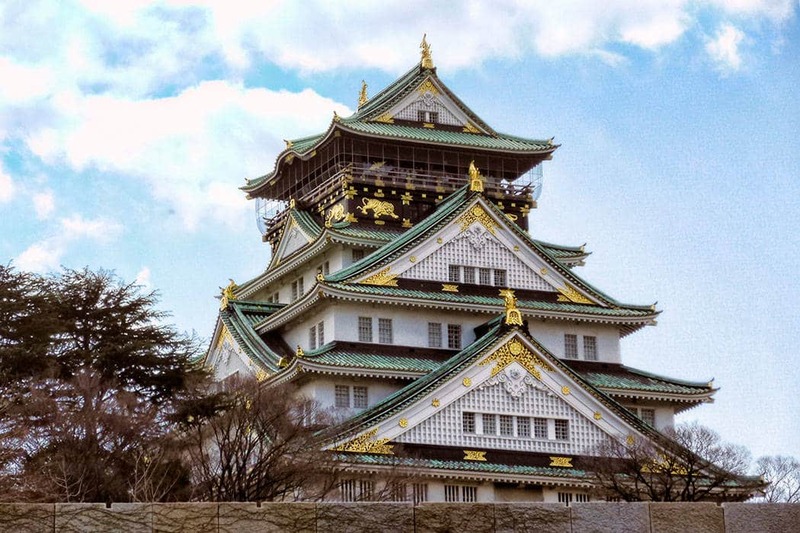 The ‘free’ things include Osaka Castle gardens and museum, the Umeda Sky Building, river and harbour cruises, museums, the zoo, botanical gardens, a natural onsen and more. There are also other attractions, shops and restaurants that are included in the pass that provide discounts or free inclusions when you show the pass. Not everything is open every day of the year. Some facilities do have maintenance periods, seasonal hours and other reasons why they may be closed on a particular day. You will get information on any closures when you buy your ticket or redeem your voucher and you can also check on the Osaka Amazing Pass website in the days leading up to your visit. The current price is Y2,500 for a single day or Y3,300 for a two-day ticket purchased in Osaka. Passes can be purchased at some station masters office in the subway and a number of information centre offices. The first time we bought the pass was from the Osaka Visitors Information centre outside JR Osaka (Umeda) station because it was the station we arrived into and was very close to our hotel. They spoke excellent English which is helpful and the purchase was a quick and simple process. You can also get the tickets from the Visitors Centre at Namba or if you’re arriving from another city you can pick them up in Visitors Information Centres around Kansai such as Kyoto and Nara. There are a few other places they show as sellers on the website but the ones I’ve mentioned are probably the easiest to access and some of the others only sell single day tickets. A new option that we are using for next trip is buying the pass voucher in our own currency in advance and then exchanging it either at Kansai Airport or Namba station. This is convenient, you can print the voucher or just show it on your phone, and it’s going to work out a little cheaper. Check the online price for Osaka Amazing Pass. Something to remember if you are buying the pass in Osaka is to take cash with you to purchase the tickets as credit cards weren’t accepted. Although it is slowly changing, in Japan you regularly can’t use credit cards as we do in western countries so we quickly got used to carrying more cash than we do at home. Japan is a safe place even in the large cities so we were quite comfortable with that although the usual precautions are sensible and most hotels will offer a room safe for your use. It’s easy to get cash out of money machines with English prompts at Post Offices or 7-Eleven stores. We also found that in addition to being convenient, there are usually some savings on fees when you get a larger amount out of an ATM machine in one transaction rather than making multiple withdrawals on a foreign card. As I mentioned we are slow travellers so you might fit more into your day than we did. Our starting and ending point was the Umeda subway station adjacent to our hotel. This probably isn’t an essential stop for everyone but it had some interesting exhibits and as the entry is included I think it’s worth a stop even if it’s just for the life scale replica of an Edo period street. From the museum it was an easy walk to the castle park. Although the main tower which houses the museum is a replica it’s well worth a look around. I would have gone just to see the replica of Hideyoshi’s golden tea room alone but do spend a bit of time, have a wander through and take a look at the view from the top. You can read more about our visit to Osaka Castle here. This garden is especially fabulous during the blossom viewing season with 600 trees in bloom but it has something to offer in all seasons of the year. During the summer it’s the azaleas and the autumn leaves are also recommended. We walked all the way around and I thought the views of the castle are the best from this garden. It’s a short walk from the castle grounds to the pier to catch the Aqualiner once you find the right gate. 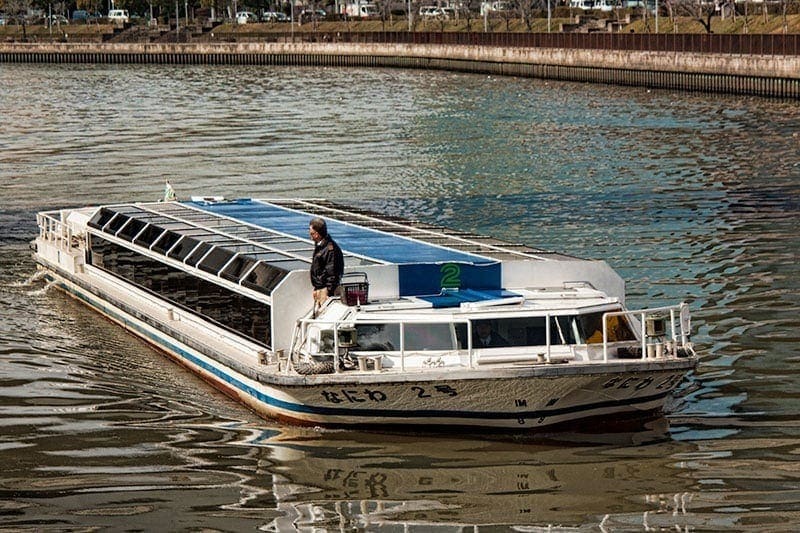 We did the one hour cruise from the Castle to Nakanoshima. This is an interesting experience for an entirely different perspective on the city. We did find out why there’s no outer deck on the boat part way through the trip, some of the bridges were so low they hydraulically lowered the roof to fit safely under! There was still plenty of room inside though and I didn’t find it claustrophobic as I’d thought I might. This was definitely worth doing, we enjoy seeing cities from above and Osaka is a huge city sprawling out in every direction. We timed it to be there late afternoon so we saw the full transition from daylight through to the city lights. Yes, I think we did! For our Y2,500 ticket we got Y4,280 of value. So we saved 46% off the cost price of doing the activities without the pass. This is probably at the lower end of savings visitors would experience. In our case a couple of things impacted the activities we fitted into the day. 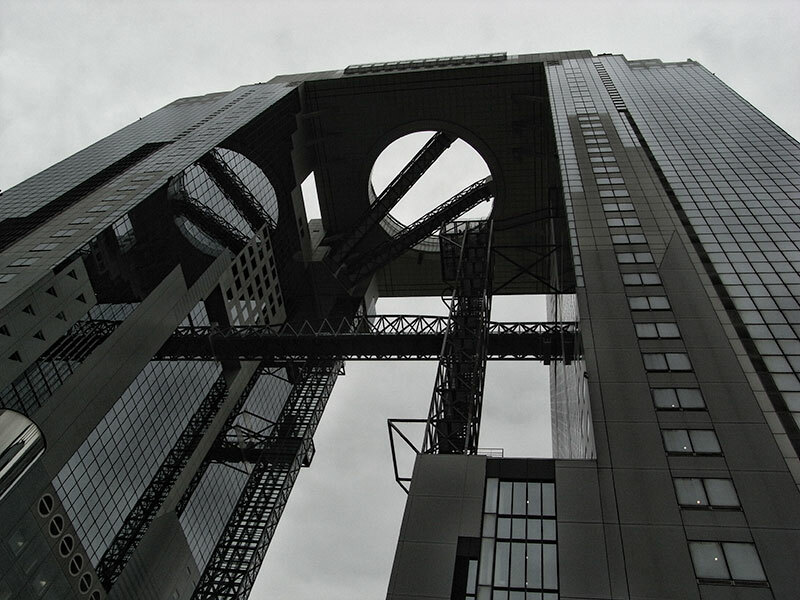 We had existing plans with a local colleague to catch up for dinner or we’d almost certainly have headed into Namba after the Umeda Sky Tower incurring return subway costs and taken the Tombori River Cruise after dinner. We also would have done the Hep Five Ferris Wheel on top of a nearby shopping centre which is normally open until 11 pm but unfortunately we were there on a day it was closed for maintenance. Including those additional activities we would have received Y6,160 value for our Y2,300 ticket. Planning a trip to Japan? We have 100’s of articles to help you. Visit of our comprehensive Japan Guide page to quickly find the information you are after? Have you used, or do you plan to use the Osaka Amazing Pass? Please share your experiences of the city in the comments below and if this post has helped with your trip planning or you think it might help others please share it. Thanks! The Kansai Thru Pass lets you ride on all the public transit in the Kansai area with the exception of JR trains. This includes Hankyu, Kankai and Kintetsu trains as well as subways and city buses in Osaka, Kyoto, Wakayama and Kobe. I don’t think it has any freebies attached, but there are a number of discounts you can get by showing the pass. When I used it in 2017 it had both two day (4,000 yen) and three day (5,200 yen) passes and the passes could be used non-sequentially, so you can use the first day on Monday and the next day on Thursday. Very flexible. The Osaka Amazing Pass had to be used on sequential days so when I used the first day I had to use it again the next day or lose it. On the other hand, while the Osaka Amazing Pass was only good on Osaka city buses and subways it had the free admission, so I saved more than the cost of the ticket just on sightseeing and the subways were, in essence, a free bonus. In all, my vacation used 4 different rail passes. The Osaka Amazing Pass, Kansai Thru Pass, Kintetsu 5 day pass (from Asuka to Nara and out to Ise) and of course a JR West Hiroshima-Wide pass. That one was five days unlimited travel through the region for little more than the cost of one round trip on the Shinkansen. Thanks Claude the KTP can be another good one for some itineraries. Japan has a variety of great passes available including the Japan Rail Pass which we use regularly on our trips. 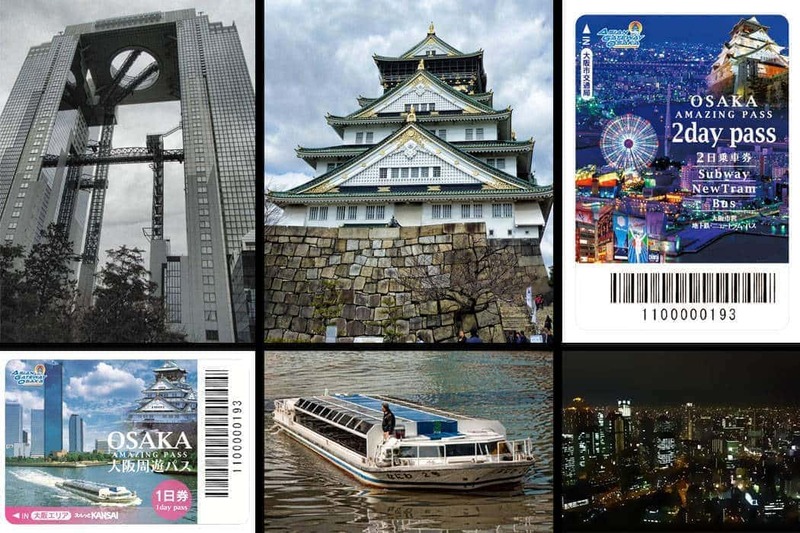 What I think is special about the Osaka Amazing Pass is that it includes not just transport and discounts but a good range of free activities that many visitors to the city, especially for the first time, will want to see. With some transport passes I can end up feeling I wasted them a bit if I only want to do a few short rides within the city. hi, great that you are answering all the comments that come in to you. i am planninf to come to japan in april for three weeks and how owuld you help me to plan out the trip, except hokkido and okinawa. Hi Zar, always happy to help answer questions where I can based on our own experience there over the years but I don’t offer a trip planning service. as from kyoto to tokyo if i want to take a shinkansen would it be cheaper to take a pass or just individual ticket? Hi Sugi, when you say city tours do you mean you are on an organised tour in the city or that you are exploring the city yourselves? It will make a difference to how worthwhile any pass is. The Kansai thru pass is for 2 or 3 days and doesn’t cover JR trains so how cost effective it would be would depends on what you plan to do and your travel style. Taking day 3 as an example, if you are likely to go to the city and explore it mostly on foot as most will do in Nara then the JR train from Osaka is only Y800 so probably not worth the pass especially as you seem to be only going one way and staying the night, not returning? The Osaka Amazing Pass may be useful for you on the day exploring there as it is transport and many popular activities are included. You’d need to consider how much of the day you have available to use it and which activities you are likely to fit in to decide whether to buy it. I have just used the one-day pass and found it good value, but would like to offer some advice on where to buy it. We were staying with my son in Juso (on the Hankyu line), but found that we could not buy the pass at the station Information Counter there (despite the web site saying you could). We were told to go to Umeda to buy it (a 150 yen fare away – if we didn’t have my Japanese speaking son with us we would have paid this fare even though it is included in the pass, but he argued the point and we were given a ‘free’ paper ticket to travel to Umeda). The Amazing Pass was available at the Hankyu Umeda information counter, but only with a Japanese language information sheet, so we were sent from there to the Hankyu Tourist Center where we were finally able to purchase the pass. Do not to rely on purchasing the pass at a location that does not routinely deal with english speaking tourists (even though the location may be listed as a place to buy it on the official web site!). I had been at Umeda station on both of the previous days and (in hindsight) should have bought it then (you can buy it in advance and it only becomes active the first time you use it). I should emphasize that despite our frustrations with the Hankyu staff at Juso they are always very polite and I am sure they do their best to be helpful (as are all the railway staff we have encountered on the stations around Osaka). Thanks for sharing your experience David. Osaka station or Umeda are good options to purchase it, or we will use Klook which offers collection options that are convenient for many travellers. As you mention, you can buy it in advance, it doesn’t activate until the day of your first use. Your blog is informative. 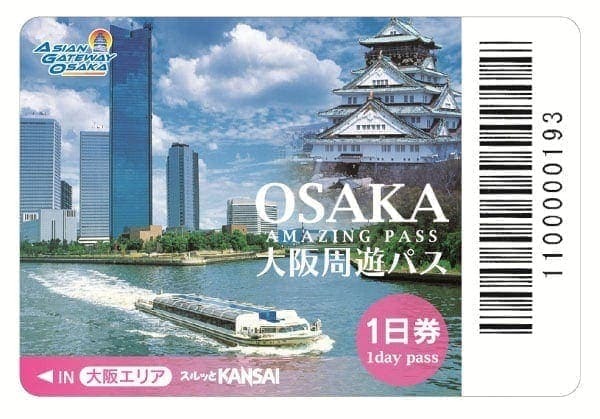 i wonder whether you know this osaka amazing pass can be used to go to Universal studio too ? since it said valid for Osaka Subway, Trains except JR Lines, and Osaka City Bus. thanks. JR trains are the most effective way to go from Osaka Station to Universal Studios and they aren’t included in the pass. However as you will likely spend most of the day at Universal Studios you would probably not get good value from the pass on that day anyway. The JR trip out there is Y180 and around 11 minutes from Osaka station. so from Osaka to Universal Studios we can used JR pass ? thank you Toni. That is correct, you could use the pass if you had one on this trip. Thank you for your information. this is a great help. Hi Donovan, we are based in Australia and the prices on Klook for us are slightly cheaper than buying in country and you pay in local currency so if it’s just a collection I’m happy to do that at the airport on the way through to the train. Otherwise, as we have done on other trips I would skip the Airport information centre and buy it in the city at Osaka station. I love your post! Thank you so much for the information! Hi Mark, you are right about the JR pass, it is very specific in identifying the individual who purchases and uses it as being on a tourist visa in Japan but the Osaka Amazing Pass didn’t require that. The inclusions are all tourist type activities so the appeal will be mostly for visitors in Osaka but they may be from other parts of Japan too not just overseas. When we collected our tickets we were asked where we were from for their statistics but that was all. Good tips! If I have activated JR pass (from Tokyo), can I use it for city trips around Osaka? Or JR pass is only for trip between cities? You don’t need a voucher to purchase the pass, you can buy it on the day you want to use it or buy it ahead and it will activate the first time you use it. I’ve never heard of them running out of passes, as they are a general item across many transport and activity options there isn’t a limited number issued per day. Hi, could you please tell me if the pass need to be used in consecutive days or if we can use it on different days? Thank you for your blog! The 2-day pass is for 2 consecutive days. i’d like to ask if its true – we can ride trains/subway for free for 1day or 2day according to our Osaka Amazing Pass ? Or is there any limit subway fare we can ride? Yes the Osaka Amazing Pass includes unlimited transport on the subway, city bus and private railways for that day (or 2 days with the 2 day pass). Note that it doesn’t include JR trains (Japan Rail) but you won’t need those to get around the city and included pass attractions. I definitely love your writing! I’m going to Osaka this August and planning to stay there for five days. My planning is to stay in Osaka for 3 days, Kyoto, Nara and Kobe a day and Universal Studio for another one whole day. May I know whats your opinion? That sounds fabulous, we love all 4 cities and the ratio of time that is right for each varies so much on personal preferences. With that itinerary I really don’t think you can go wrong. Have fun. Hi dear, i know this is a really old topic. But i’m planning a trip to Japan this summer. And i’m very much confused of how the amazing pass works. For instance, if you go to Osaka Castle with the pass, do they scan it or do they do anything to it? Since i may not be using the free privilege of pass of visiting all the tourist sites in Osaka in one day, Is it possible for me to just show my pass, although i have not started using it? Your answer would mean the world to me. Hi Cindy, all inclusions of the pass, both the transport and attractions, need to be used during the period the pass is activated. It’s a stored value card that is scanned at the train station or Osaka Castle, the first scan activates it. When we purchased it we also received discount vouchers, those could be used separately. Have really been enjoying reading all your blogs and advice on where to go and things to do. We’re going to Japan in mid November for 18 nights all up. We arrive in Osaka late on a Friday night and have another 3 nights before heading to Kyoto. Would like to get the 2-day Osaka Amazing Pass but wondering if it would be really busy using it over at least one day of the week-end. I have read that with the cruises (such as the Santa Maria,Tombori, Aqua Liner) if they’re filled with regular customers you can’t get on. Would there be a long queue and do people with the passes have to wait longer until seats are available? Hi Joy, we used it on a Friday and Saturday and had no issue with long queues or other customers getting priority. It’s not an express pass so you do have to queue like everyone else, we just showed it and it was like any other ticket. Everywhere seemed very familiar with it and it was never a problem. We went in February (winter) but Osaka isn’t a major destination for fall colours (although I would love to see it at that time) so I don’t imagine it would be unusually busy. Cherry blossom time I think could be a different story. It’s a good length trip you have planned, have a fabulous time! Thank you and for your comments on Amazing Pass. We have 4 nights in Osaka, 4 in Kyoto, 3 in Takayama and 7 in Tokyo. We’re thinking of cancelling the nights in Takayama and adding them to Osaka and Kyoto as there seems to be more to see and do in those places. The fall colours are really important to us as well. Would really appreciate your thoughts. Thank you for your reply and it’s really been helpful hearing your thoughts. I agree with what you said re travelling time, no autumn colours, etc and decided to do away with Takayama. Being our first time I don’t think we will feel cheated by not going there. I know we’ll have heaps to do in the other cities and we also prefer to take our time. We did find it quite a challenge though with the re-shuffle of dates in Kyoto and Osaka to find suitable hotels (that weren’t “Adult” and didn’t cost an arm n leg), especially in Kyoto. I’m very happy to say though we now have our hotels finally sorted .. whew! 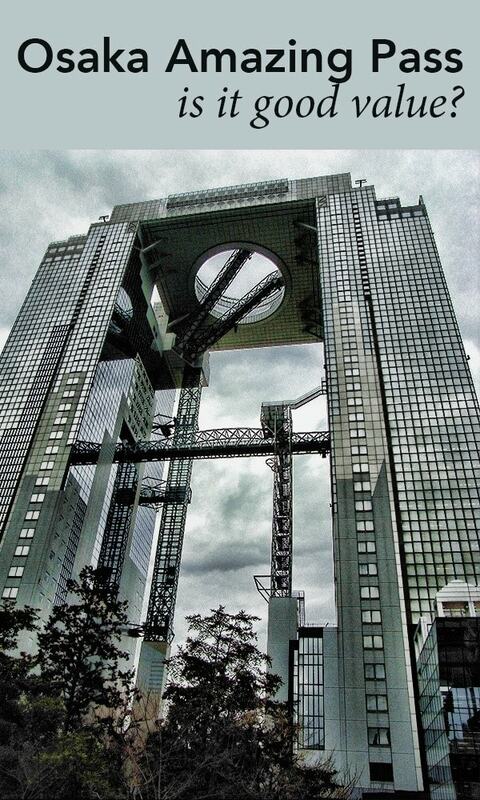 In Osaka we’d like to do the Umeda Floating Garden, Hep 5 Ferris Wheel, Tombori River cruise, Japan night walk, Osaka Castle & garden, Tsutenkaku Tower, Tempozan Giant Ferris Wheel, Santa Maria cruise, Aqua Liner, Sakishima Observatory and Nakanoshima River Cruise .. on the 2 day Amazing Pass. Does that sound doable or will we be pushing it? I suppose it really will depend how long the queues are for each. Looking forward to Nara – Todai-ji/budda, Kofuku Ji & Kasuga temples and all the beautiful deer. In Kyoto, Arashiyama – Iwatayama Monkey Park, Togetsukyou bridge, bamboo forest and Nishikiichiba night market. I’ve heard a lot of people talk about the hill to the monkey park and that there are two choices – steps (steeper but shorter) or a gradual incline walk (but longer). Have you been there and which do you prefer? I don’t care too much for hills lol. I’m also taking your list of “10 Free Things to do in Kyoto” which all look really good. We’re still very much working on all the other things we want to see and do, including Tokyo. I have little notes everywhere! We’re big on people watching .. and eating too of course. Thanks so much again. Hi thanks for your informative blogs, I am using them to organize our family holiday to Japan in October. I have planned a day trip to Himeji and thought we would explore Mt Shosha in the afternoon. Would another option be Himeji and Hiroshima all in one day? Is that doable? I am unfortunately running out of days! Thanks again for your detailed information. Hi Gaby it is technically possible depending on what you want to do and how long you spend at each place. It would probably be too rushed for us though in honesty, I’d pick one of the other. If you pick the right trains it’s 55 minutes from Osaka to Himeji, then around 1.5 hours on to Hiroshima. So with a longer day and targeting specifically what you want to do in each place it is possible. Many thanks for sharing this. My friends and I are leaving for Osaka next month. Will be spending 6 days there so we want to make the most of each day. This was really helpful. Hi Michelle, lucky you! Have a fabulous time in Japan, Osaka is a great base for seeing so much from. Is this your first time there? Thanks! It’s my second time but I only spent 2 days the last time I was in Osaka. It will be a first for 3 of my friends, though. If I may digress, my family is planning a 2 week vacation to Australia in July. It’ll be a first for all of us. I’m going to check your site for tips on that as well. Thank again! Dotonbori is high on our list of places you must go in the city, Osaka should definitely claim it’s place on any foodies travel plan! We only had two days in Osaka on that trip so the 2 day pass helped us maximise that, even so I think it might have focused us on activities along the route we choose, there are still plenty of other place in Osaka we want to visit even after several return trips now. can i ask a question please. what is the best rail pass to buy, i am spending one week in total in Osaka, i would like to go to kyoto and Nara on day trips. should i get ICOCA-HARUKA or a Kansai Area Pass, i will be coming and going from Kansai intl Airport. Hi Bruce thanks for visiting our blog. Generally from Osaka if you don’t plan to use the shinkansen and limited express it won’t pay off to buy the Kansai Area Pass for those side trips. Those trains won’t save you much time from Osaka anyway. Kyoto on the special rapid will take 30 minutes and cost Y1120 return, Nara would be around Y1600 return and the Haruka from the airport Y1060 whereas the Kansai Area Pass is around Y2200 a day so unless you had several other JR trains involved those days it wouldn’t be economical to get it. Have you found the Hyperdia.com site. It’s in English and if you put your origin and destination station it will give you options so you can see how long a trip takes, cost and departure times which can be really helpful to plan your visit. I’d definitely recommend an ICOCA or PASMO style stored value card which you can use on most transport. They aren’t discount cards but they make transit so much faster and simpler. There are day tickets in Osaka for the subway and buses which might save you a bit if you make quite a few trips in a single day but we generally don’t find it worth while ourselves and prefer the flexibility of our PASMO’s. Enjoy your planning and have a fabulous trip! We loved Osaka, and the pass. Japan in general is actually set up very well for tourists, and we loved our time there. Great tip to check in every city you visit for multi-day passes for transport and attractions. Hi Tom, I have started to check more often for passes, particularly in transport it can make a big difference. 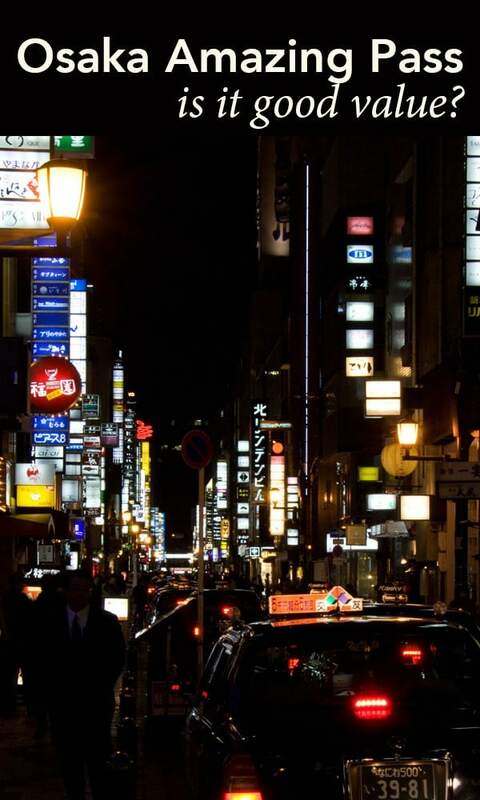 Mostly in Japan, with a couple of notable exceptions we found they were more beneficial for convenience than cost saving but that’s a lot to do with our style of travel and that we love to walk and many Japanese cities and towns are well laid out for that. I’ve heard that many of the city passes in Europe are fantastic value. Hi, I read somehwere about a limited- one way travel pass from Namba station to Kansai International airport. The ticket price should be within 1000yen. Do you have any idea about this? Please let me know. Hi Cheng. The only way I know to make the trip at that price point is on the Nankai Limited Express which costs Y920 and takes around 50 minutes. They do have the Kanku Chikatoku ticket for Y1000 that you can use to get to any station on the Osaka Subway line but as you can go direct to the Namba Nankai station it’s cheaper just to buy the normal ticket. Either ticket can be bought through the vending machine (with English language option) at the airport. Have a great trip. How lovely is Osaka? I think the key thing about passes like these -no matter where you are in the world – is that you read the fine print and do your research. Little things, like if one day means one calendar day or a period of 24 hours split over two calendar days, can make all the difference in the world when it comes to assessing the value of the pass. My pet peeve is when passes (which include transit and attractions) don’t include the one or two most popular (and usually expensive) museums in a city. It’s always great to see what value other people have got out of a card/pass before signing up. We tend not to get them because we like to spread things out and pick and choose sights and experiences, but I can see in this case it would be very worthwhile. We had a 3-day Hakone Freepass for our stay there – I must go back and work out whether it was worthwhile or not! I have a post on the value of the Hakone FreePass for a daytrip that will go up in a few weeks time. I would be interested to know how it stacks up for the longer trip though, especially now with access to the Owakudani ropeway still closed off due to the recent volcanic activity. I think the Osaka one might have been an exception for us on value but we do find they can be very convenient not having to queue for tickets during the day and especially with buses being a bit slow and complicated paying cash if you don’t have the right money. I tend to like city passes because most places I visit are over a weekend or short visits so I have to squeeze in a lot in a short amount of time. That being said, I also look to see what I can get out of it. If the places I wanted to see anyways are on the pass, then it’s a no brainer. Thanks for the review Toni – generally I’m not a huge fan of these value passes either, mainly because they usually include a bunch of museums which I’m not normally interested in visiting, and everything we do want to take in is usually excluded from the pass, though it sounds like you fitted quite a lot into your time, and the inclusion of public transport is a big win in my mind, especially if you can’t pay with credit card. I’m heading to Japan shortly so this is getting bookmarked. In a play synonymous with technology I’m baffled you routinely couldn’t pay with a credit card? What’s up with that? Thanks James. Japan is still very definitely a cash based society, that’s not to say there are no credit cards accepted but in many places they aren’t. Card use is a lot less common than in many Western countries where we are basically cashless even for small purchases like a coffee or a magazine. It’s changing now but even a couple of years ago in Japan we were also surprised that a country leading technology on so many fronts had so little free or visitor accessible wifi. I think I only purchased a similar pass once and only did it because it was a very good offer. Don’t fancy some of the constraints and rather take it slow. In this case, I clearly see the value of getting one. Oh, and the castle is beautiful! The test for us Raymond was whether we got value just doing what we wanted to in the day, not changing our speed of travel or including / excluding things because we had the pass. I think there can definitely be a temptation to change things up to get your moneys worth but we then wouldn’t enjoy it as much. That’s great to know and if I return to Osaka I will surely get one – thanks! I’d say that’s definitely excellent value- especially for first time visitors.